celery recipes. 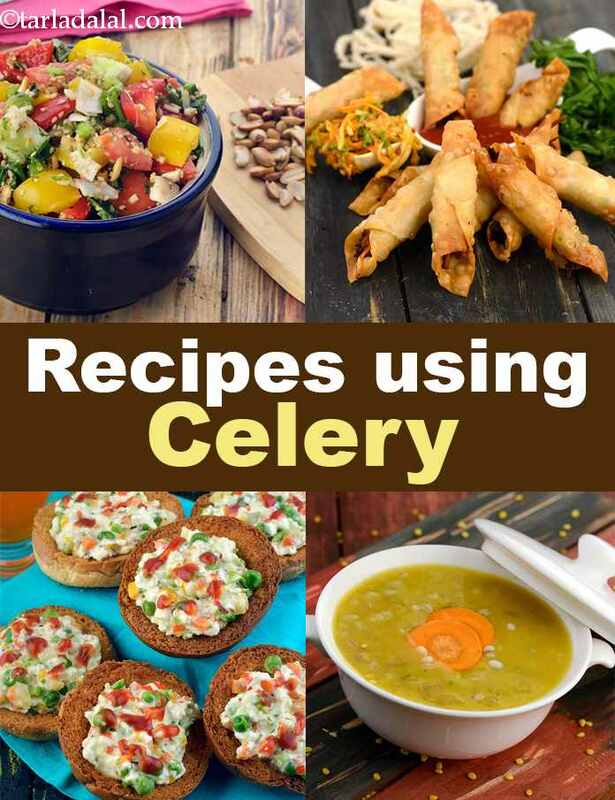 ajmoda recipes, Indian celery recipes. Celery, also known as Ajmoda, is a vegetable that grows in the parsley family with long stalks and leaves at the end of them and has a crunchy texture and slightly salty, watery taste. It is used alongside carrots and onions in many dishes as their flavors combine very well together. These three combined also form the base of many French sauces. Celery stalks as well as the leaves are used for cooking. Sometimes even the seeds are used as a spice. Celery is diverse enough to use in many different dishes. One of the most simple and best ways to eat it is to make a Cheese and Celery Sandwich. Combined with lettuce, mayo, tomatoes and garlic, this sandwich is a definite winner for all. For something a little bit more on the exotic end, Cheese Carrot and Celery Cigars are ideal. This has a little touch of Asian food because of the addition of soy sauce and is an excellent party starter. The wonder vegetable is used in dips and sauces which we use in our daily lives. For a really fun dip there is always a Curd Dip with Spring Onions, Celery and Garlic to have with chips but the real kicker is the Schezuan Sauce. Yes! schezuan sauce does contain celery, in fact it is one of the most important components of it. It is celery that gives the sauce a slight crunch and peppery taste along with the garlic and chillies. Soups are as healthy as they come. A simple vegetable broth heals the body much faster than any medicine. Celery with carrots, onions and peppercorns forms the base of a Vegetable Stock that is used in many other soups as well. Even if not using the stock, you can make a wonderful, hot Celery Soup with dill that proves to be equally healthy. A lot of people do not like its taste on its own. This can be covered by combining it with different fruits or vegetables to still get the health aspect of it without the taste. Calcium Booster is one such drink where the flavors of Beets, celery and parsley come together to get an ultimate, powder packed drink. Crunchy celery makes a wonderful addition to a Creamy Beetroot and Corn Salad with its saltiness adding to the experience. This vegetable is something that is used all over the world from the Chinese to the Italian and the American. Chinese Veg soup is a medley of different vegetables together in a hot broth of deliciousness. The salty and crispiness of celery goes extremely well with different vegetables used in Chinese cuisine and hence is frequently used in Fried rice and even Schezuan noodles. Fettuccine in Celery Almond Sauce shows how diverse celery is in terms of cuisine as well. This pasta definitely makes an impression and as strange as it might sound, is loved by all! If leftover with some cooked pasta and do not want to waste it, make Pasta Cheese Balls which has soft, chewy and crunchy texture all in once! Add celery to Grilled Mediterranean mushrooms and be surprised at how good these two work together! If you want to know more about the Uses of Celery, then you can check out our article on that. Enjoy our celery recipes. ajmoda recipes, Indian celery recipes given below. A fibre laden drink made with pineapple and celery, pepped up by a touch of black salt is a perfect drink to prevent and overcome constipation.